Surprising end to the US Labor Day weekend as Microsoft announced its next big strategic move in mobile space to acquire the world’s second largest handset supplier Nokia at the end of Q2 2013 according to Counterpoint Research’s Market Monitor service. The long speculated “possible acquisition” of Nokia by Microsoft finally hit the papers as Microsoft drummed is renewed ‘strategic need’ of expanding its hardware business to further tightly control the ecosystem. We believe this need emanates from the trend with the now most powerful companies in mobile industry and Microsoft’s key competitors Apple and Google making strides towards becoming highly vertically integrated though on paper the respective business model differs by a wide margin. What does Nokia Devices & Services arm acquisition mean for the mobile Industry and the entire value chain? Fills the much needed portfolio gap “mobile hardware engineering & related patents” with a high smartphone synergy. Microsoft will gain full access to world’s largest supply chain and distribution channel assets. Microsoft will be able to gain control of Nokia’s world class manufacturing facilities, resources and engineering talent. For Microsoft Nokia’s 200 million per year declining but marginally profitable feature phone business will be a burden for short- to mid-term. 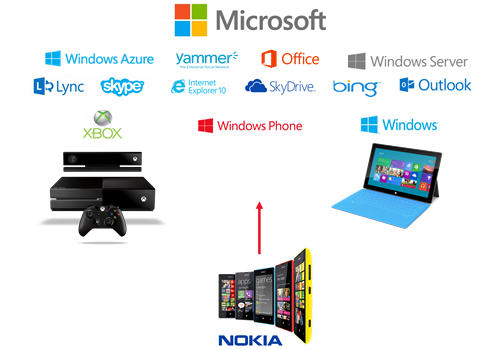 Microsoft will have a big marketing task to solve the mobile “sub-brand” puzzle in terms of Windows Phone vs. Lumia vs. Surface. With current licensing model and now with Nokia’s acquisition, this deal will possibly close the avenue for licensing opportunities to other device manufacturers, operators interested in Windows Phone ecosystem. Thus, Microsoft will need a radical change in its mobile business model by reducing the licensing fees to minimum and monetize through the huge portfolio of services it has. Deal potentially paves the way for Stephen Elop to succeed Steve Ballmer as Microsoft CEO even though the deal announcement suggests Elop will continue to head the Nokia business within Microsoft but we see Elop now as the front runner to succeed Ballmer as overall head of Microsoft. For a long time it was viewed as the ‘evil empire’ but this sentiment has shifted more toward Google. However so far Microsoft has failed to take advantage of the more open minds of consumers. The Windows 8 computer operating system has been poorly marketed and Windows RT a solution to a problem no one has. Windows Phone is a powerful platform that we believe consumers would be willing to accept if only they were given a chance to understand what it has to offer – something Microsoft has again failed to do. This puts onus now completely on Microsoft to better communicate its mobile (Windows Phone) story well as until now it has been all Nokia which has done all the hard work in driving the Windows Phone ecosystem with differentiated innovation and Lumia brand. Microsoft has its work cut out to first leverage the synergies and align to the “clock speed” of that of likes of Apple or Samsung to deliver the products on time and not as a routine software vendor. Critical to success in gaining wider adoption of Nokia WP8 devices will be the early integration and empowerment of the development and marketing teams within the combined entity. Extended turf wars and in fighting will kill what impetus currently exists. However, the toughest challenge for Microsoft would be to retain Nokia’s existing worldwide talent over the period of next two years and not follow Google’s path which has almost blew up Motorola’s talent pool since acquisition couple of years ago. This is a big step for Nokia as a company which ruled mobile phone industry for a decade, this acquisition possibly ends the Finnish legacy in this segment and a chance to stand up again in the smartphone segment on its own. Though Microsoft will own the “Lumia” & “Asha” brands but the future of these ‘brands’ look bleak considering a strong association with “Nokia” rather than with Microsoft. As a result all the hard work put in to revive Lumia as the popular smartphone sub-brand goes down the drain, return on investment on Lumia brand hence is pretty low. Overall, we believe the $7.4 Billion valuation of Nokia Devices & Services plus huge portfolio of patents, manufacturing and engineering resources, supply chain scale & distribution reach is on a much lower side considering Motorola a fifth of Nokia’s size was sold for more than US$12 Billion to Google couple of years ago. The entire acquisition is highly undervalued for Nokia’s shareholders. However, for the Finnish surviving Nokia, Nokia Solutions & Networks (NSN), fast-growing HERE arm and other future innovations biz now becomes much leaner without extra legacy devices baggage and can grow much faster independently. We believe HERE is a highly potential platform to power current and next generation connected devices (smartphones, cars, wearables, etc). NSN on other hand will look forward to win opportunities from the robust LTE growth forecasts according to Counterpoint’s Market Outlook service with networks powering not only billions of mobile devices but billions of other connected devices across number of verticals. This is a big deal for component vendors and the entire supply chain which dependent on Nokia with low confidence now on the possible future relationship and what happens to the feature phone business under Microsoft. But in terms of Microsoft’s existing partners and distributors they will have a wider addressable market to sell to in terms of products and services. 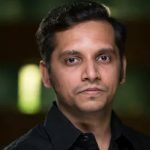 The deal could possibly affect Nokia’s existing feature phone business (with low interest from Microsoft) which would leave a big supply gap for the near to long-term and might be a big opportunity for Asian tier-1 vendors such as Samsung, ZTE, TCL-Alcatel to Tier-2 & 3 vendors such as Micromax, Lava, Karbonn and Others. For OEMs such as LG, Huawei, ZTE, HTC and even Samsung which were evaluating Windows Phone as a possible alternative to Android will now divert more resources to other upcoming platforms such as Firefox, Tizen, Ubuntu and even Jolla. For Apple & Google this could be a big competitive challenge and how it reacts to Microsoft becoming more vertically integrated as Apple. Ecosystem wars have thus got more interesting. All eyes will be on Microsoft as to which way it will go in terms of business model perspective – either Apple’s or Google’s way. Conversely, Microsoft could also innovate to find a middle ground (from biz model perspective) to keep the partners, customers and consumers happy with great and tightly integrate connected hardware, software and services. Lots of work needs to be done on this front from scratch (again) to cement the third ecosystem spot and challenge Apple for the second spot in long run.